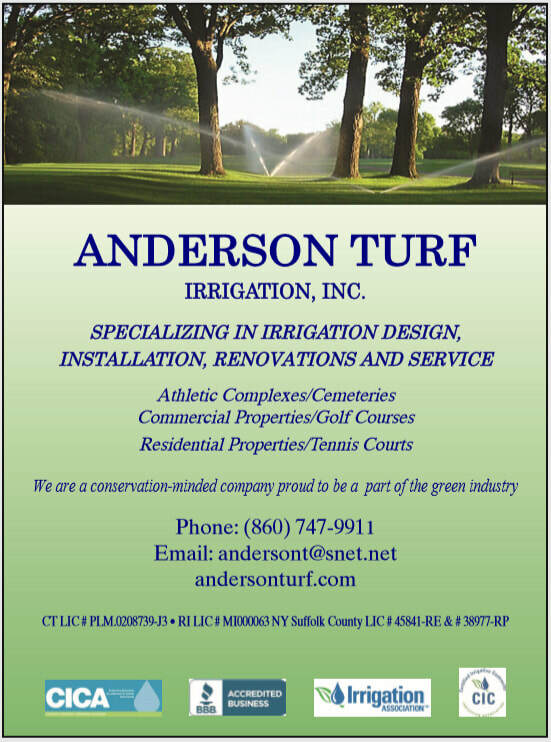 Anderson Turf Irrigation, Inc. has over 50 years of experience and we take pride in our work. We are a licensed irrigation contractor and our firm installs and services irrigation systems. We are ready to assist you with the design and selection of irrigation equipment. We design systems that are suited to your specific needs, are easy to operate and maintain, and that minimize waste of our limited water supplies, saving you time and money. Our installers are equipped with the most up-to-date equipment to maximize efficiency and minimize damage to your turf. After purchasing a new system, you will find our service department readily available. History of Anderson Turf Irrigation, Inc.
Jesse, my father, started this business in 1959 as a general contracting company and in 1962 he installed his first irrigation system. Jesse grew the company and installed irrigation systems in Connecticut, Massachusetts, New Hampshire, New Jersey, New York, Rhode Island and Vermont. I was initially employed as an irrigation laborer from 1985-1989. Moving up I became installation foreman for athletic fields and commercial irrigation systems as well as residential irrigation systems until 1991. From 1991-1993 I was a Service Technician and from 1989 to the present time I have designed and sold irrigation projects of all sizes and I oversee the office personnel. 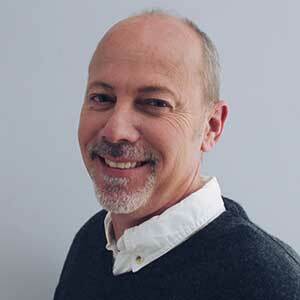 In 2003 I was voted Vice President of Anderson Turf Irrigation, Inc. and in 2007 was voted President. As President of the company I perform all of the above jobs and more. During my 30+ year career, I have had a strong sense of education. I learned this from my father as he was one of the first irrigation contractors in New England in 1962. He was also one of the founding members of the CICA which lobbied for and helped implement irrigation contractor licensing which ensures education in this industry. Education is key to the success of our industry. Being part of the CICA I wrote the newsletters and provided most of the articles in them. Some of the articles I wrote became education material for classes (i.e. “Programming Irrigation Controllers” and “Water and How it works for Us”). In 2008 I sat with two members of the CICA in front of the Connecticut legislatures and helped pass the irrigation weather sensor bill for homeowners. 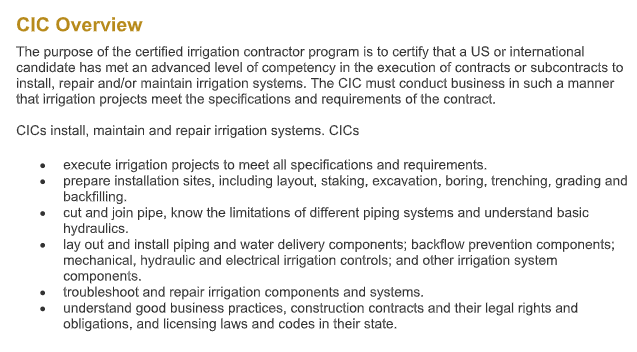 Along with keeping up to date with the latest education and state laws, I provide our staff with many of these classes for irrigation contractors.